Please see below the catamarans sold archive with selling prices and listed prices of catamarans sold by broker Gary Fretz. These are only a sampling of the hundreds of catamarans Gary has sold. Click the PDF files for more details. Contact Gary for more information and to find the right catamaran for you. The Leopard 46' 3 stateroom version is considered one of the best designs of an all-round blue water cruiser. She is fast, comfortable and safe and was designed with ease of maintenance in mind. This 38 Leopard is in excellent condition and came with a brand new Livingston 10' hard dinghy and 9.9 hp outboard engine. Came will all the basic equipment. 40' Lagoon, Lagoon 400. Charter boat well maintained. Lagoon has succeeded beautifully in developing a new 450 catamaran to replace the famous Lagoon 440. Yanmar 4JH diesels with low hours. 40' Lagoon, Lagoon 400. Charter boat well maintained. OWNER'S VERSION. Custom built for the owner in 2015, this Lagoon 450 flybridge is the definition of "Turn-key". 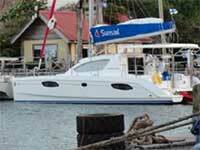 Contact Gary for more information and to find the right catamaran for you.